There is a lot talk about what capture card works best for capturing VHS tapes. Many people have their favorite device. I have always used video capture cards more for playback than capturing. I used a Matrox RT 2000, Pinnacle Pro one, Canopus DV Storm and several others. The PCI capture cards all worked but in 2003 I ended up getting a Datavideo DAC-100 IEEE Fire Wire converter and never purchased a PCI capture card again. The Fire Wire DV converters work with FCP, Premiere Pro, Avid Edius etc. They did not need a driver or plugins. That was great for SD playback but when HD became the norm I opted for the Intensity Shuttle. I can get the BMD Intensity Shuttle to do more than it was designed to do (I left a link) when using Premiere Pro. Having said that what editing software and capture cards do you folks use now or in the past for playback and why? I am just curious. Do you ever give up ? Capture cards are primarily used for preview whilst capturing. You have to use the capture software rather than general playback software. And capture software, in my experience, does alter the video. (De-)Interlacing just as one example. Having said that what editing software and capture cards do you folks use now or in the past for playback and why? Why would I use a capture card for playback? My computer already has a quite capable graphics card. Its performance far surpasses the 4:1:1 color decimation of DV. Do I ever give up? WTF? I was reading in another post about what capture devices people use to capture VHS tapes. I thought I would find out what other people are using for playback. Having said that capture cards are not primarily used to preview whilst capturing. The Avid Media Composer was not designed for capture only. All the capture cards from Fast, Pinnacle, Canopus, True Vision BMD are designed for playback as well. Some products now days only offer playback to broadcast equipment since most people don't use tape anymore. Software does not alter the image of interlaced video. You might get interlacing artifacts on your computer screen but you should watch interlaced video on broadcast compliant hardware not a computer monitor. That is why AJA, BMD, Pinnacle and Matrox made third party hardware for FCP, Premiere, Sony Vegas etc. You should also see your editing on broadcast compliant monitor not a computer screen if the final destination is to be broadcasted. I am not suggesting everyone does editing for broadcast but I would like to think a few people might. Why are you talking about 4:1:1 color decimation of DV? If you are editing interlaced HDV video or Sony's XD CAM video at 1080i (4:1:1 or 4:2:2 does not matter) it would be best to see it on broadcast complaint hardware as opposed to your computer monitor. The color space and composition will also be slightly different on a computer monitor as opposed to broadcast compliant hardware. If your work is never broadcast you would not need a 3rd party playback devices. If you do work for broadcast then it would be wise to use 3rd party hardware. You can mix 30P and 60P video into a 1080i sequence. In the end 1080i is used for broadcast most of the time although 720P is sometimes used. People use the products from AJA and BMD for that reason. They want a broadcast complaint preview so there are no surprises when the project is broadcasted. I would like to think a few people here do work for broadcast but maybe not. I would like to think a few people here do work for broadcast but maybe not. Several of us also worked for studios. However, VH has always primarily been a forum for casual hobbyists. But for broadcast, the facility would be buying the gear. There's no reason to have a broadcast setup at home. As mentioned, 4:1:1 DV (what DAC-100 uses) would not be anywhere in a broadcast workflow. Nor even would the gear you mentioned. The RT2000 and DVstorm were quite nice for their day, higher-end DV NLE cards from about 20 years ago, but not broadcast gear. For that, it's all about realtime appliances. Broadcast has also vastly changed in the past 10 years, to the degree where streaming and multicast has invaded, and broadcast setups often resemble server datacenters. It got to the point several years ago where some concepts were getting over my head, and I can't follow along anymore. Broadcast isn't just about the video anymore. LordSmurf you are confused again. Having said that stop doing your own interpretation of what people write. Take it as it was written without any interpretation. Can you do that from now on? I never said that RT 2000 was used for Broadcast. I simply listed some of the products I used. Having said that NHK of Japan used a lot of the Canopus DV Products as did several other Asian Stations. Also many members in the Canopus forums posted images of their studios. They were nice legit studios using Canopus products. They stated they used Mini DV cameras and the Canopus Storm for infomercials that aired. One guy switched from the DV Storm to using Premiere and the ADVC products. He convinced me to do the same although I bought a DAC-100. I seen professional studios with Avids using the ADVC products in the Canopus forums. I communicated with them in the Canopus forums like I am communicating with you in this forum. The only difference is they had high-end video production studios and were willing to post image of their facilities to help people out while you on the other hand want money in order to help people out. I should also ad many places did accept standard mini DV-25 for playback. Also the Eduis software is being used at news stations as I write this. I agree broadcast hardware is not need like it once was nor did I say otherwise. I will say back in 1998 probably 95% of the video content people viewed was created at a post production house or news room but as of today that is not the case. The Internet and social media has changed that. Broadcast compliant hardware is not needed like it once was but it is not dead yet. they used Mini DV cameras and the Canopus Storm for infomercials that aired. MiniDV cameras shooting/submission for low-budget footage happened, and in fact still happens with cheap HD cameras. But the station itself isn't using an ADVC to convert analog tapes, nor shooting, nor do any of the internal ingest/editing on their end. For a short time, when people were still submitting tapes as the stations converting to digital workflows, some smaller operations may have in-house converted (as opposed to simply denying the submission due to not meeting requirements), and a few less-knowledgeable stations may have opted for cheap DV converters. But that's a lot of ifs, and would be a tiny footprint. An ADVC as a cheap output preview is loads different than using it to lossy-convert analog tapes. Also the Eduis software is being used at news stations as I write this. As part of a Grass Valley system. I've seen the ads and specs in Broadcast Engineering. I will say back in 1998 probably 95% of the video content people viewed was created at a post production house or news room but as of today that is not the case. The Internet and social media has changed that. . I cringe every time I see low-quality Youtube and cell phone video enlarged on TV, but thankfully it's not that often. Video is still being created in newsrooms and post house, but the biggest change has been smaller at-home/at-office can as well -- if using quality equipment, to the required specs of the submission. I've worked with a number of filmmakers, especially for documentaries. They pull camera and non-DV-converted footage into Premiere or FCP (never really anything else), and export to ProRes or whatever the spec sheet says is needed. The polish of the video really depends on the skill of the editor. And these days, even Youtube videos have some pretty high production quality. You a wrong again Lordsmurf. Check out the ADVC 700 and the ADVC 1000 those are designed for broadcast facilities. 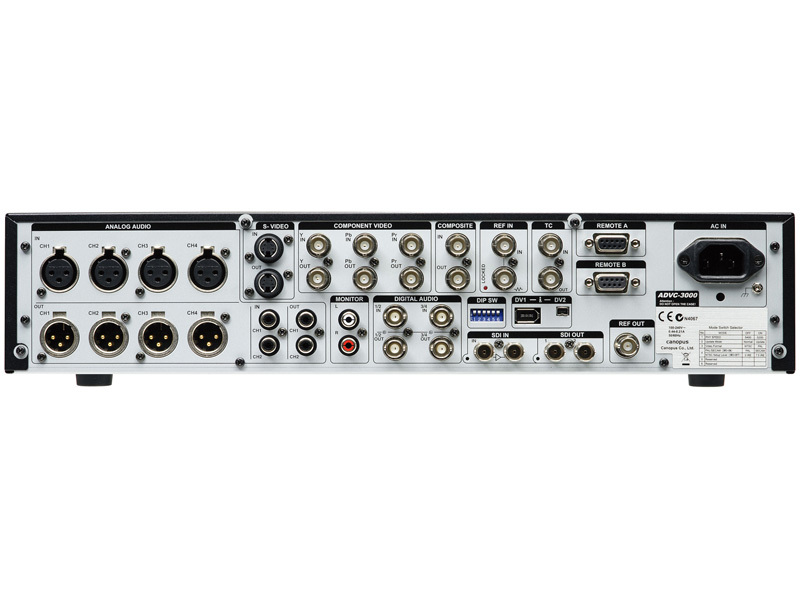 They have RS422 deck control port, gen-lock, BNC connectors and XLR connections. Why would a hobbyist pay $3,000.00 for an ADVC product? Canopus would show those products in professional broadcast facilities on their website from time to time. They also had film to video transfer products as well as the Aurora software. I don't think you are aware of all the stuff Canopus made. Having said that I stated people did commercials and infomercials using the high-end DV cameras and the Canopus DV Storm. Now you are admitting I was right. I know I am right because people would post images of their cameras and their studios and let people know how and why there were using different Canopus products. Some of the Studios also had Avid Media Composers in them along with Canopus products. 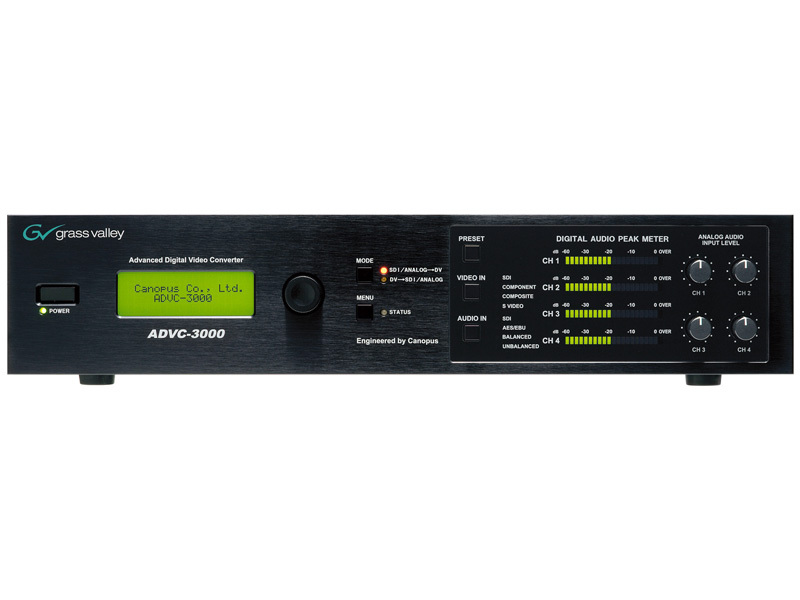 Here is an image of an ADVC 3000. I know and I also know the Canopus ADVC converters were used at several broadcast facilities so why are you arguing with me? Having said that why not just admit I was right all along? Of course video is still being created in news rooms and post production house but now people can see video on Facebook and YouTube. I watch more Facebook and YouTube videos than I do TV. A lot of people do. Why are you talking about 4:1:1 color decimation of DV? I ended up getting a Datavideo DAC-100 IEEE Fire Wire converter and never purchased a PCI capture card again. This is a DV converter. You never mentioned broadcast in the OP. I find your tone rather testy. If you read the posts VRaines you mentioned 4:1:1 in you response to me. I never mentioned 4:1:1 color space until you did but to ad insult to your injury many playback facilities accepted Mini DV-25 so what is your point? Nobody said DV-25 or HDV is the best option but they were both acceptable at many facilities. I find your response to be both testy and inaccurate. I am here to help people out and find out what A/V gear other people use. If that bothers you it is just an extra bonus that was never intended. New to video capture - need help on why video quality is so poor? Elgato Video Capture Virtual Dub Error "Unable to start video capture"